November 13, 2011 - In 2009, a Colgan Air Bombardier operating as Continental Connection crashed on an instrument approach to Buffalo Niagara International Airport, Buffalo, New York all 47 people onboard were killed. The NTSB investigated the crash and had issued its report. The investigation was a lengthy process which included testimony, revue of the company’s records, etc. Family members of the deceased filed civil law suits against Colgan Air and Continental Airlines for wrongful death. The attorneys for the families learned that Pinnacle Airlines the parent company of Colgan Air had emails that indicated airline officials had doubts about the captain's flying skills. This information had never been turned over to the NTSB during its investigation. National Transportation Safety Board Chairman Deborah Hersman said in a statement on Thursday that the NTSB had learned two weeks ago that Pinnacle Airlines had withheld this information and ordered the airline to release this information. Hersman said “We were disappointed to learn of internal documents released by Pinnacle Airlines parent company of Colgan Air, that were not provided to the NTSB during the course of our investigation into the February 12, 2009, crash of Colgan Air Flight 3407. 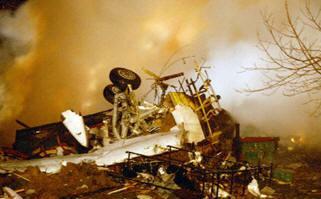 "The NTSB investigation began immediately after the crash and concluded with a public meeting on February 2, 2010. Today, in a letter to Pinnacle Airlines Corp., the NTSB requested that the company make available any and all information regarding the training and technical qualifications of the Captain and First Officer on-board Flight 3407. “While the content of the newly released email exchanges appears to be consistent with information our investigators learned through other means during the course of the investigation, it is critical that the factual record of this accident be complete. The previously undisclosed documents do not appear to give reason for reconsideration of the NTSB's final report and probable cause determination”. On February 12, 2009, about 10:17 PM, a Colgan Air Bombardier DHC-8-400, N200WQ, operating as Continental Connection flight 3407, was on an instrument approach to Buffalo Niagara International Airport, Buffalo, New York, when it crashed into a residence in Clarence Center, New York, about 5 nautical miles northeast of the airport. The 2 pilots, 2 flight attendants, and 45 passengers aboard the airplane were killed, one person on the ground was killed, and the airplane was destroyed by impact forces and a postcrash fire. The National Transportation Safety Board determined the probable cause(s) of this accident was the captain’s inappropriate response to the activation of the stick shaker, which led to an aerodynamic stall from which the airplane did not recover. Contributing to the accident were the flight crew’s failure to monitor airspeed in relation to the rising position of the low-speed cue, the flight crew failure to adhere to sterile cockpit procedures, the captain’s failure to effectively manage the flight, and Colgan Air’s inadequate procedures for airspeed selection and management during approaches in icing conditions.